Where Roots And Wings Entwine: Baby and Children's Markets Taking Over the UK! Baby and Children's Markets Taking Over the UK! Earlier today as I was trawling facebook I came across a lovely mumpreneur, Monica Strydom who is a new addition to ‘Baby and Children’s Markets’ and I wanted to help spread the word about this fabulous idea. Baby and Children’s Markets was set up in the UK by Leanne and Steve Taylor. They set up the company after starting a family in Australia and trying to save some money. They managed to save a fortune and get all the baby equipment, toys and clothes they needed for less buying from pre-loved markets. 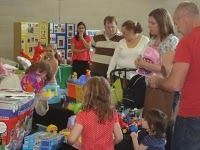 This sparked the idea to run markets for selling pre-loved baby and children’s items. The company was established in January 2010 and after being a success in their home county Berkshire they decided to franchise the company and spread the idea across the UK. "We've got about 16 mums on the books at the moment, organising and running successful markets in their home towns." says Steve. Each market features stalls that have cut-price baby essentials. A brilliant part of the markets is that parents can meet other parents whilst they get a bargain. It’s also great as parents can hire a stall and sell pre-loved, pre-owned items that they no longer need and raise some much needed extra money when you have a family. Also small businesses and mumpreneurs can book a stall to sell their products. "The customer base is endless as there are always new mums or new families moving into an area," says Steve "Our existing mums tell us the markets are really sociable events, where people can meet like-minded mums and get support and advice, while shopping for a bargain or clearing the clutter." Baby and Children’s Markets currently have 16 franchisee’s covering 11 Counties and the latest addition to the ever growing brand is in the area of Essex, which is run by the very enthusiastic mumpreneur, Monica Strydom. She is successful with other businesses already, with one of her businesses being a children’s online retail store. If you are in Essex you can join Monica on the Baby and Children’s Market Essex page on facebook. I think the concept of Baby and Children’s Markets is fabulous, especially as most of us have to be careful and wise with our money and savings. This is perfect for those of us who try to raise extra cash or get a great bargain. You can shop and get a bargain and can also hire a stall to sell pre-loved and unwanted, outgrown baby and children’s products to raise some money for yourself. What a lovely idea. Great idea for a blog.